High quality walking trousers while hiking are like butter on bread. Without functional ones on the legs, the trekking adventure only "tastes" half as good. 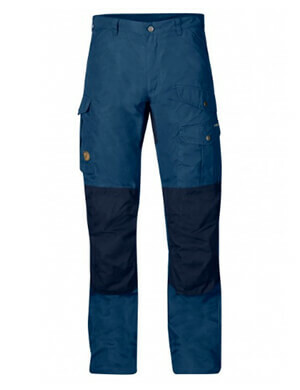 Walking trousers are special legwear that are mostly used in the field of outdoor and alpine sports. Optimal outdoor wear is decisive on a comfortable hike, on an alpine tour or on a trekking trip to distant lands. Good walking trousers allow for the best possible freedom of movement and should also be highly comfortable to wear. Depending on the pants model, walking trousers are wonderfully light, breathable, quick-drying, as well as wind, water and dirt repellent. Thanks to the comfortable cuts and pleasant materials, walking trousers are also a favorite in everyday wear. High-quality outdoor trousers for women and men are made of light and robust functional fibers. A mix of nylon, elastane, and cotton has in the meantime proven itself in numerous outdoor tests. Light nylon mixed fibers have the advantage of immediately absorbing the moisture produced during sweaty activities conducting it through the functional fiber away from the body outwards. The garment dries very quickly and prevents a moist feeling on the skin. The functional clothing thus actively prevents the body getting chilled. Therefore, these functional fibers are used not only specially for walking trousers, but also generally for manufacturing outdoor clothing. Alpine athletes also find functional material mixes in hiking shirts, trekking jackets, walking shorts and walking trousers. Functional textiles with a high cotton content are, in comparison, usually more robust, resilient and warmer. Rough rock, rugged surfaces, wind, and rain can hardly harm pants or a jacket with a higher cotton content. Travel loving outdoor enthusiasts and leisure hikers, who mostly stay in warmer regions, are better off with light walking trousers made of functional fiber. Ambitious alpine athletes and lovers of Scandinavian countries usually pick robust and more strongly processed trekking trousers with a higher cotton content. Depending on season and destination, a combination of different materials and pants types makes sense. For instance, light hiking pants and an additional pair of shorts in the hiking backpack. Or a second pair of zip off trousers as universal outdoor trousers is just the thing. Outdoor experts like Fjällräven, Haglöfs or Vaude offer numerous models and options. High quality outdoor and hiking trousers offer all lovers of nature a multitude of features and functions. They come as hiking shorts, three-quarter pants, zip off variants or with long legs. With the so-called zip off trousers, it is possible to separate the lower part of the trouser leg via a zipper. If the trousers also have a vertical T-zip, the hiking shoes don't even have to be taken off in the process. Hiking trousers or mountaineering trousers also have the knee and seat areas reinforced to increase the life span. On long tours with trekking poles and hiking sleeping bags, that is definitely a plus. On light hikes, that can even be carried out in trekking sandals, such reinforcements are not really necessary.